On January 18th, Kari, Noah, Mom and I trekked up to the Manhattan School of Music (MSM) for the first concert of 2010 in this Season of Sondheim. 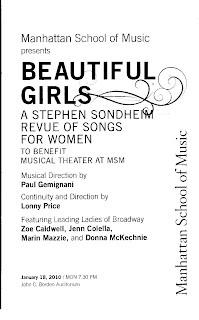 Zoe Caldwell, Marin Mazzie, Donna McKechnie and Jenn Colella starred. The MSM Chamber Sinfonia, under the baton of Sondheim veteran Paul Gemignani, served as accompaniment. Billed as a Stephen Sondheim Revue of Songs for women, the evening was directed by Lonny Price. The ladies transcended a groan-inducing script, narrated by Zoe Caldwell, to perform Sondheim's songs either typically sung by female characters or about women. 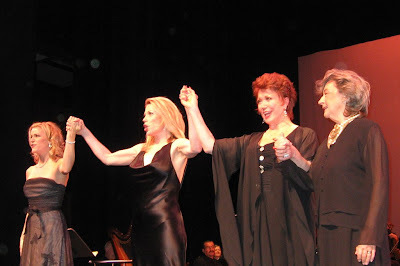 Donna McKechnie and Marin Mazzie are no Sondheim neophytes, both veterans on Broadway. Donna was in the original Broadway cast of Sondheim's Company, and starred in the Paper Mill Theatre's production of Follies. Marin was Tony nominated for her role in the original Broadway production of Sondheim's Passion. Zoe Caldwell has done a number of productions of A Little Night Music, notably at the LA Opera and Ravinia. Highlights of the evening included: Donna McKechnie sang So Many People, Some People and a very exciting high-belted I'm Still Here. Jenn Colella nailed Another Hundred People and Not Getting Married Today (with Marin obviously on the soprano and a very funny Donna as the groom). Marin Mazzie thrilled with her her high soprano on The Miller's Son and Not A Day Goes By and gorgeous portrayals of Every Day a Little Death and Take Me to the World. Marin and Donna gave a hysterical rendition of There's Always a Woman. They joined together as a trio to sing "You Could Drive a Person Crazy, complete with choreography, and Pretty Women . Zoe Caldwell stepped away from her hostess duties to perform Liaisons, accompanied with the full orchestrations. All of the ladies joined together to perform an eleven o'clock version of Broadway Baby, lead off by Zoe. In addition to the MSM Chamber Sinfonia, other MSM students were Margaret Peterson, MSM Young Artist, who beautifully sang I Remember from Evening Primrose. The MSM Symphonic Chorus closed the evening with Make Our Garden Grow from Candide, which Sondheim wrote additional lyrics for. The Manhattan School of Music is on the Upper West Side, just north of Columbia University. It's easy to get to on the 1 train as it's just a few blocks north of the 116 Street at Broadway stop. We paid a whopping $20 each ($12 for Mom!) for fabulous orchestra seats on this evening . They have a calendar full of exciting events, including solo artists, jazz concerts and operas, some of which are just $5 per ticket for open seating. (Message from Flamingbear: "This picture was actually taken at a very similar evening in Colorado Springs in September 2007. Not a great show, but fantastic performers and I didn't have to travel to NYC to see them.